The gruesome illusion of a graveyard has been transformed to the reality of a garden. Behold! Much better! White Dot is showing his feline approval. In the bed on the left (or westmost), I've planted carrots (Caracas from Jung Seeds) in two rows planted with radishes -Cherry Belle from Jung's in Row 1 and French Breakfast from Seed Savers Exchange in Row 2. Two rows of Red Romaine from SSE, then three lettuces - one row each of Bronze Arrowhead, Baby Oakleaf, and Red Salad Bowl (all from SSE). I also planted nasturtium seeds: Empress of India from Burpee's and Cherry Rose Jewel from Botancial Interests. Obviously, this recording of planting is intended for memory enhancement purposes. *ahem* I also grew some plants from seed and those are getting accustomed to the cool and gray June weather on the front porch. I'll provide details when I plant them. I also have some seeds for climbing nasturtiums to plant, along with green (and purple!) filet beans and sugar snap peas. Between my schedule and the rain, this garden will eventually get planted. I should soon have some peony blooms. Please excuse the photo--I must need to clean the lens or something. These three peonies are growing in the box on the right in the "second" row. I ordered a bunch of hosta, peony, and daylilies in late summer several years ago via the internet. When they arrived, I didn't have the time or enthusiasm to plant them around the yard so I just designated that box and the one next to it as "nursery" boxes. I've had varying levels of success with my nursery box strategy. The peonies are thriving as are the daylilies. Although, once the daylilies bud, I fight with the deer for the blossoms. Unfortunately, hunting season and daylily blooms do not coincide. Therefore, I'll move the daylilies before they bloom this year. Maybe I'll see what colors the blossoms are, finally. The hostas had to compete with weeds last year but they're recovering right now with a bit of grass mulch. Typing this post brought forth a vague memory of the hostas also suffering from deer attention, besides my inattention. I may need to move them sooner and let them recover in the landscaping where they may have a better chance. After the peonies bloom, I'll relocate them around the yard--maybe a month after? I'm not sure about the timing as I traditionally add peony roots to the garden in very late summer or early fall. Opinions, anyone? Yesterday, I met with a new-to-me spinning group in Madison, the Fair City Spinners, and, later in the day, joined the Rio Library Quilt Guild. Both are very nice groups of people and I learned a lot just yesterday--so much that I think my brain hurts from the learning and all the socializing. Just one month away from daily interaction with groups of people and look what happens! Obviously, ambiverts must have to keep their extrovert tendencies exercised or they atrophy. Thanks to Carole for the invitations and the great conversation. I'm spinning wool from that long-ago venture to Taos in a pretty peachy orange. It was only one largish ball of roving. Of course, I don't have any record of who I purchased it from. Carrie, do you remember? Then we came upon the sheep that didn't lamb this year. Just look at that face, really, all those faces. Then we went to the lamb barn. I bet Carole thinks I am nuts. There is also a yard the sheep have access to but most were in the barn that day for whatever reason sheep have for being there. Her "do" is a bit flat but I'm told she normally has a lovely hat of hair. Carole and her husband, Dave, own Yorkshire Rose Farms. Carole also dyes and sells yarn, in addition to the other products of their farm including grassfed (delicious) meat and eggs. The sheep are Romney, Rambouillet, and Tunis (I hope I got that correct) and various crosses. It was a lovely visit. Thank you, Carole, as a visit with you and the lambs is a guaranteed path to a happy outlook. Both cats (and their sisters) want to go outside but can't because Wilson and I are going up to the Farm in a few hours and we can't have the kitties running a muck while we're gone. The sunshine was only visible for about 60 seconds so far this morning. The high temperature yesterday was 61 degrees F. This is July? That's the same bobbin I started Tour de Fleece with--it is loaded up a bit more but the time allocated to spinning hasn't been too extensive. Speaking of Tour de Fleece/Team Crankypants.........You know the Groucho Marx scene where the phrase "Doctor, it hurts when I do this!" and Groucho says, "Then don't do that!"? Well, I have to put my spindle on the sideline because I'm aggravating my shoulder and ribs somehow. I'm taking action to heal up but no spindling for a while. The wheel is still in action so I'm still cheering for Team Crankypants. Good thing this was a no-stress event. :D I am happy that I've been spinning more, and that's what counts. Our trip up to the Farm is because Dr. E is there visiting our mom. He's only here for a short time so we're heading up this afternoon to say hello and meet with other family at the Roxie in Oshkosh for dinner. He's back from vacationing in Europe with his two sons and will be able to tell us more about running with the bulls in Pamplona, Spain ( o.O ) as well as the other fun stuff the three of them did. The garden is coming along despite my absence. I had a full list of things to do yesterday. However, sometimes you need to make room for one more thing, especially when Mother Nature is involved. The cherries were ripe yesterday so I grabbed the step-ladder and a bowl and picked (and pitted) about five cups of tart cherries. I'm actually glad they ripened yesterday. Ripening on Monday would have meant the birds got to enjoy them all. I picked just the ripe ones with many left on the tree. So, we're sharing. Of course, once they were picked and pitted, I was faced with the horrible task of deciding what to make with them. Cherry and Nut Muffins using the Joy of Cooking recipe for basic muffins-full fat version. I added 1.5 cups of tart cherries, and about 3/4 cup of nuts (pecans and walnuts), filled up a jumbo muffin tin and presto......Breakfast! and Snack. and Lunch. and Late afternoon snack. Just Kidding. Maybe. Definitely tomorrow's early breakfast. Yesterday's spinning is the bump part on the bobbin. How I managed that odd bump I'm not sure. All the cherry picking/pulled-pork making/laundry tired me out but I did make progress! I've got just a bit of this fiber to spin....I'm hoping to make a sweater with it whenever I finish spinning. It is a warm neutral which should be perfect for a basic cardigan. Hey! I'm back from Upper Michigan and still have two days before I have to go to work! How cool is that? We had a nice relaxing break, caught up with sleep, and generally feel pretty darn good. I'm catching up with blogs today, well some, since I have 1000+ new posts showing in my Google Reader. Busy bloggers! I'm also conquering the laundry, packing my work suitcase, and throwing a pork roast in the oven for some yummy pulled pork for dinner. No good sky photos for Saturday Sky but I do have a little show and tell. The skies this past week were generally overcast and wet in my part of the world, but here's a photo that Wilson snapped this week. Yup, bear tracks. He said he didn't see the bears, probably a mama and her cub, but they had walked the trail he was on before he got there on his way to tickle some trout. While on vacation, I auditioned some spindles to prepare for Tour de Fleece as part of Team Crankypants. I think the two on the right are in the running for my travel hand spindle and the pink stuff is some roving from Susan's Fiber Shop that I don't know the wool specifics of, outside of it being wool and relatively inexpensive. It has been in the stash for a while but it is pleasing to the eye. I'll be spinning some other natural gray wool from Woolgatherers in Fond du Lac when I'm home on Margaret, my wheel, now that we are on good terms. I'm going to have to pay more attention to my wool, aren't I? My relaxing included some sock knitting on the man-sock, err, socks for Wilson with my first short-row heel completed. Love it! Thanks for the instructions, Cookie! I also worked on Icarus --- I've recovered reknit past my ripping and then some but I'm still on chart 1. There was also some reading of the latest J.D. Robb paperback, Salvation in Death. (Still a good read but I think something was missing, perhaps the personality conflicts?) and I started Tanya Huff's Valor's Trial which is definitely calling me. This in book four of a series.....I know I read book three in this series but I'll have to look up the other two. I'm taking a day of vacation today. Whoop! Don't get too excited...today is full of chores and a massage (well, that's okay to be excited about) so my Saturday will be free to spend all day at the Wisconsin Sheep and Wool Festival! I've signed up for a spinning class so I can learn to use my lovely Margaret Rose, um, more efficiently, yeah, that's the word. I've signed up with Beth to help with the pre-ravelry Afterparty set up over in Rome. Then it is fun at a fiber party! I am looking forward to a very fun day and evening. 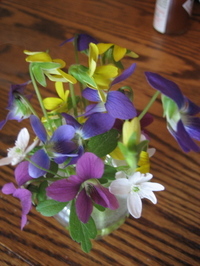 One of today's tasks is to take these garden lovelies and make them into sauce. It will just be a basic sauce that I will bag up and freeze for use throughout the year. I like to add shredded carrots to the sauce. They add a bit of natural sweetness and other vegie goodness to the sauce. I also have boatloads of basil to turn into some pesto but I'm not sure if I'll make my way into the basil patch today or not. The drywall is being delivered right now. After the rain we had all day yesterday, the ground is very mushy, so the big truck/semi is staying on pavement and the guys are hauling the drywall over the lawn. All before 8 AM. I know one trade that I'm not suited to, for sure. I'm still enjoying my morning coffee. Saturday, I met Nora in Verona at the Sow's Ear. I thought I was early but it turned out I arrived at the same time as Nora. First, she lured me closer with the promise of a closer look at her newly blocked shawl. Then she brought out a large garbage bag. A garbage bag that looked suspiciously familiar to one that I used to know. 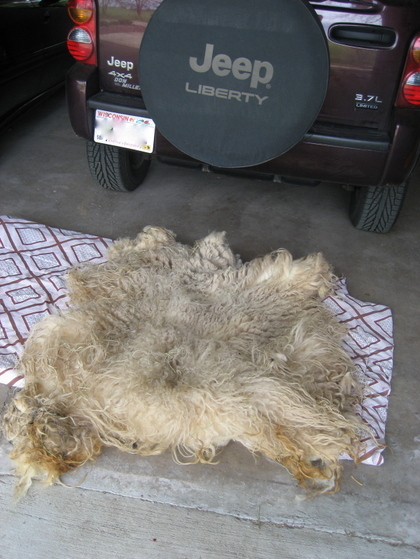 She gave it to me and I looked inside to see Artemesia's fleece, 2008 vintage. I did my best not to cry and scare Nora. Nora, Stacey, Joan, and Cookie conspired to find a replacement Icelandic fleece for the one that was lost a short while ago. Friends, I am so touched by your thoughtfulness. Thank you, thank you, thank you, thank you! See how lovely (and large) it is! 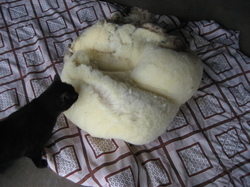 And here is a view of the creamy underside with the fleece folded. White Dot is performing a quality control check. He found it meets his very high standards. 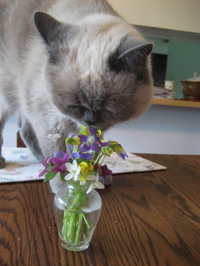 He's not quite sure why Nora got the heebie-jeebies when she touched it. Nora had to head off to her family event far too soon. I started home but stopped at the garden center to support the local economy. When I got home I found DH had gathered these for the table. Aren't they lovely? Blue thinks so. I am so glad I blog. I will always be able to remember this wonderful day of surprises and friendship by just reading my archives should I ever misplace this memory in my old age. Oh yes...............DH knows exactly where the fleece is and what it looks like.